Is Dark Chocolate Healthy? No, but Cocoa Flavanols Are! This post is sponsored by CocoaVia® Brand. A dark rich chocolate brownie or smooth, creamy chocolate bar tastes even sweeter when you know it is good for you. After all, chocolate is full of healthy compounds right? Unfortunately, it is not that simple. In its native state, the cocoa bean contains a mixture of compounds that may be beneficial to your health. Processing cocoa beans into cocoa powder or your favorite sweet treat destroys most of these helpful compounds. You can forget choosing dark chocolate based on how bitter or dark it is. The benefits of chocolate come from cocoa flavanols, not from the percent cacao or the darkness of the chocolate. Cocoa flavanols are the beneficial plant-based nutrients (phytonutrients) naturally found in cocoa. No other food on Earth can match cocoa’s unique blend of flavanols. Cocoa flavanols work with your body to maintain healthy levels of nitric oxide. Nitric oxide helps maintain the healthy flow of oxygen and nutrients to all parts of your body. Supporting healthy blood flow is essential to helping you maintain who you are for years to come. In fact, our entire bodies, including our heart, brain, and muscles, depend on healthy blood flow, which helps us feel and perform our best. How can I Choose Dark Chocolate Rich in Beneficial Compounds? Don’t look for health benefits from dark chocolate . Most chocolate isn’t nearly as healthy as you may believe. It takes approximately four average dark chocolate bars (more than 700 calories) to get the same amount of cocoa flavanols as you get in a single serving of CocoaVia® cocoa extract supplement. So enjoy chocolate – in moderation, as your sweet treat, but not as your daily source of cocoa flavanols! So if chocolate isn’t a reliable source of flavanols, how about cocoa powder? Unfortunately, most cocoa powders aren’t much better. With no added sugars, less fat, and more fiber than typical chocolate, cocoa powder can be a better option for getting a chocolatey experience. However, cocoa powder might not be a reliable way to get your flavanols. Cocoa flavanols are typically destroyed when cocoa is processed. Any cocoa powder that is Dutched or alkalized contains significantly fewer cocoa flavanols. To take the guess work out, you can try CocoaVia®. 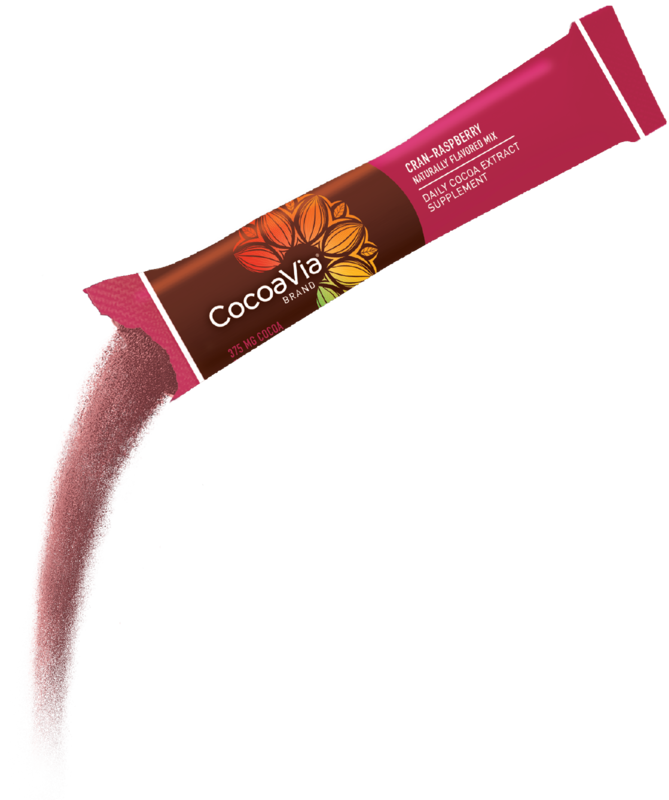 CocoaVia® cocoa extra supplement delivers the highest concentration of cocoa flavanols in a cocoa extract supplement today – 375mg per serving – . and numerous scientific studies have demonstrated these flavanols promote healthy blood flow from head to toe†. It’s easy to start your day with CocoaVia® supplement. Add one delicious powdered stick pack to the beverage or food of your choice. For more information on CocoaVia® supplement, which is supported by more than two decades of scientific research, visit www.CocoaVia.com. I often start my day with a peanut butter chocolate shake. 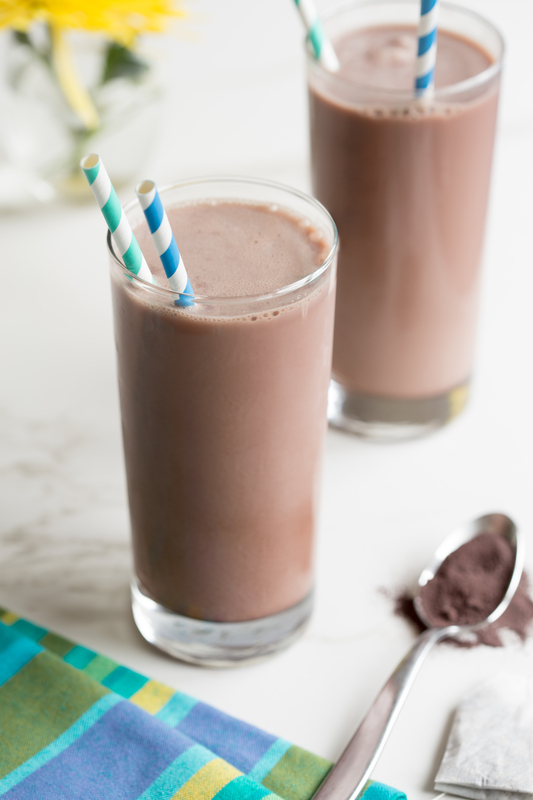 I mix one stick pack of CocoaVia® Unsweetened Dark Chocolate supplement into my morning smoothie with peanut powder, ice and milk. †The Food and Drug Administration has not evaluated this statement. This product is not intended to diagnose, treat, cure, or prevent any disease. Posted on September 26, 2017 Categories nutrition, UncategorizedTags alkalized, beneficial compounds, bitter, blood flow, brain, cacao, calories, cocoa, cocoa bean, cocoa extract, cocoa flavanols, cocoa powder, CocoaVia, dark, Dark chocolate, Dutched, eyes, flavanoids, healthy, heart, nitric oxide, NO, oxygen, percent cacao, phytonutrients, processing, supplement, sweetLeave a comment on Is Dark Chocolate Healthy? No, but Cocoa Flavanols Are! From celebrity websites and diet books to popular Instagram feeds and “clean eating” blogs, its trendy to ditch dairy. 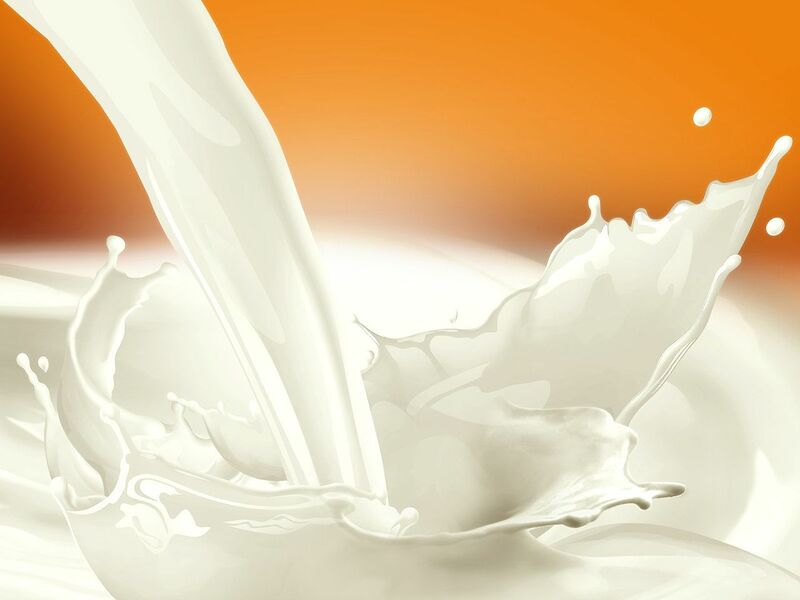 Yet experts say going dairy-free has multiple downfalls – and it may be downright dangerous – especially for kids and young adults. Kids and teens have a limited time period to build bones. 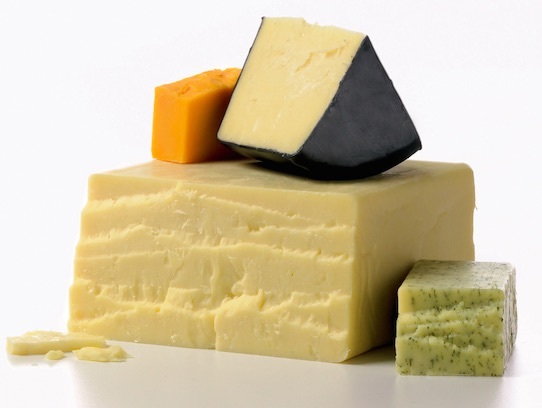 A dairy-free diet during these critical growing years could mean a child doesn’t reach their full height potential, they may have an increase in stress fractures during adolescence, and a greater chance of developing the brittle bone disease osteoporosis as an adult. In addition to 9 essential nutrients, including bone-building calcium and vitamin D, the combination of protein and carbohydrate in dairy will help build and fuel active muscles and minds. Introducing kids to new foods can be both fun and easy. In addition to offering a food multiple times and modeling healthy eating (eating a wide variety of foods in front of your kids), try pairing less familiar foods with ones that are more familiar. Many kids love getting in the kitchen and helping prepare food, especially when it comes to baking. Why not make muffins, bread or even a cake with vegetables in it. Carrot cake, zucchini muffins and avocado cupcakes taste great and make a child more familiar with these vegetables. Once kids see them again, sautéed at dinner time, baked into a lasagna or sliced on top of a sandwich, they will be more likely to eat them. As a kid I played hard then lost steam quickly. Luckily my parents let us snack whenever we felt the need to eat. Frequent snacking can help keep children alert and attentive. Pack snacks that please their taste buds while fueling their bodies with nutrients they need for good health. Naturally sweet fresh or dried fruit, trail mix, yogurt, string cheese and nut butter with whole grain crackers are all excellent options that will satisfy your child’s taste buds while providing the nutrients they need for good health. Rinse blueberries with water and blot dry with a paper towel. Set blueberries aside on a plate. In a bowl, stir together gluten free all purpose flour, almond flour, baking soda, salt and Swerve sweetener. In a separate bowl, whisk together eggs, whipped cottage cheese, milk and oil. Add flour mixture to egg mixture and whisk or stir until just blended. Blend in blueberries. Lightly coat a large frying pan or skillet with cooking spray then heat over low – medium heat. Pour small amounts (about 1/2 cup) of batter onto the skillet. 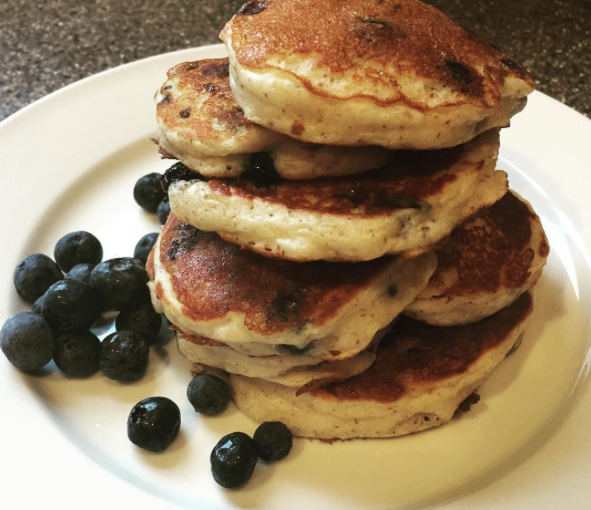 Flip each pancake when golden brown underneath and partly cooked. Move to plates and enjoy! Look for Greek yogurt with “live cultures (aka good bacteria)” or the “Live & Active Cultures” seal. The cultures are good bacteria that take up valuable real estate in your gut, helping your body digest food and decreasing gas and bloating. The amount of healthy, versus harmful, bacteria influences body weight and how much weight you can lose while following a lower calorie diet. Plus, a study published in the International Journal of Obesity found people who get their calcium from yogurt, as opposed to other foods, may lose more weight in their belly. Even more evidence to support yogurt consumption comes from a study showing dieters who ate five servings of dairy, such as Greek yogurt, daily lost more weight and abdominal fat than those who ate just three servings every day. 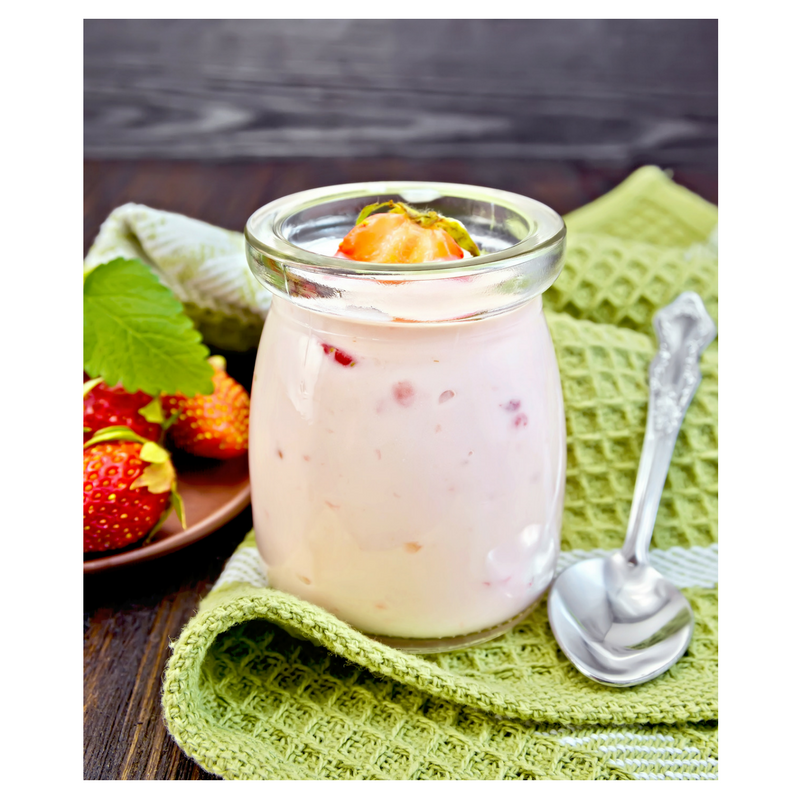 A more recent review of the research found higher dairy intake was associated with lower risk of obesity in the midsection and yogurt seems to help keep weight in check. Though nuts are relatively high in calories for a small amount of food, people don’t gain weight when they add nuts to their previously nut-free diet. A study in over 13,000 adults revealed nut eaters, those who ate at least ¼ ounce of nuts or peanuts (technically a legume) per day had smaller waists than adults who didn’t eat nuts. Additionally, tree nuts and peanuts contain a considerable amount of monounsaturated fat. Dieters who eat more foods containing monounsaturated fats may lose more belly fat than those who eat the same number of calories per day with less monounsaturated fat. 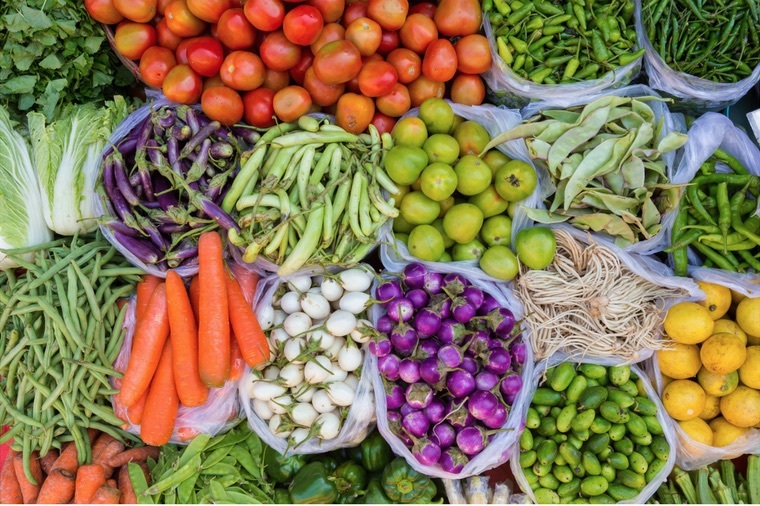 When examining dietary patterns, weight and waist circumference in close to eighty thousand people over a 10-year period, researchers found those who ate more vegetables every day had both a lower BMI and smaller waistline compared to adults who ate few vegetables. Asparagus contains prebiotic fiber, a type of fiber that is food for the good bacteria in your gut. Plus, asparagus is a natural mild diuretic making it the perfect food before hitting the beach or wearing a more formfitting outfit. Avocados contain a good amount of monounsaturated fat, not to mention nineteen vitamins and minerals. But, their monounsaturated fat is the ticket to a smaller waistline. In one study scientists gave obese adults with type 2 diabetes diets rich in saturated fat, monounsaturated fat or carbohydrates. Those on the high carbohydrate diet ended up with fat redistributed to their stomachs while the monounsaturated fat rich diet prevented fat redistribution to the belly area. Plus, a look at dietary intake data from close to 18,000 adults found body weight, BMI and waist size were all significantly lower in avocado consumers versus those who didn’t include avocados in their diet. Popcorn is a whole grain and when you pop it yourself on the stovetop (or in a brown paper bag in the microwave, just add good old fashioned popcorn kernels in a brown paper bag and fold the top) and top it with a little spray butter or spices for flavor, you’ll end up with a snack that takes a long time to eat and fills you up on relatively few calories. In addition, several studies show people who eat about three servings of whole grains per day weight less and have a smaller waistline compared to those who don’t. Peas are naturally rich in resistant starch, a type of fiber that isn’t completely broken down or absorbed during digestion. Cooking and cooling peas to make a pea salad will significantly increase the amount of resistant starch they content. Rodent studies show resistant starch helps reduce stomach fat and increase hormones that tell the brain it’s time to stop eating. Choose eggs over cereal in the morning and you’ll tame hunger pangs for hours after breakfast, decreasing the likelihood of overeating later in the day. Make a meal containing at least 25 – 30 total grams of protein (the protein is in the white of the egg so this equates to 4 – 5 egg whites though you can choose any combination of whole eggs and egg whites as long as you consume at least 4 -5 of the whites) so you can cash in on the satiety-enhancing benefits of eggs. 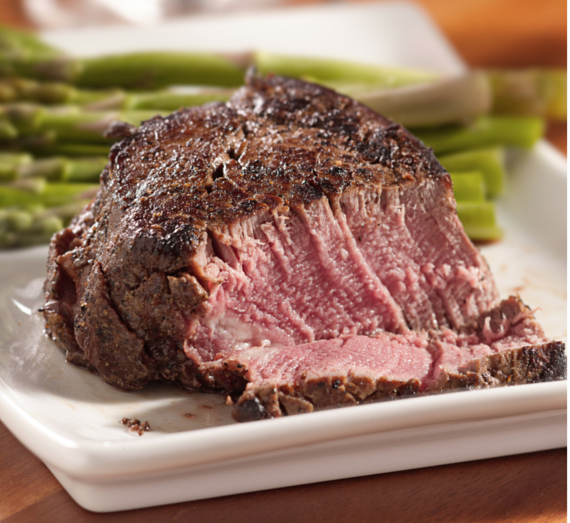 Added bonus: following a high protein diet for a short period of time can lead to significant reductions in belly fat. The combination of caffeine and antioxidants in green tea may lead to small to moderate reductions in body fat and waist size. However, you need to consume quite a bit of it so get creative and cook with green tea by brewing it and using it to cook rice (it’s particularly good with jasmine rice), make stews, soups or stocks. You can also poach fruit green tea or use dried green tea leaves as part of a rub for meats, tofu or fish. Barley is a cereal grain with a nutty taste and consistency that is a cross between pasta and rice. In a double-blinded trial (both the men and the researchers didn’t know which food they were getting), Japanese men were given rice or a mixture of rice with pearl barley. The group receiving the pearl barley and rice mixture lost a significant amount of visceral fat, the kind that covers your organs like a thick winter blanket and increases risk of heart disease, stroke and type-2 diabetes. Compared to the rice only group, the group who ate pearl barley decreased their waist size. Blueberries are an excellent source of dietary fiber, which will not only help keep you full but also help keep your waistline in check. Plus they are a natural source of prebiotic fiber – the kind that the good bacteria in your gut munch on. A flat belly is one of the most recognized signs of a fit body. Blast away abdominal fat with high-intensity cardio and build the underlying muscle by regularly switching up your training program. Also, incorporate a 30-minute abs classes to your routine. At least one study found you can spot reduce if you exercise the same muscle group for at least 30 minutes at a time. Keep in mind abs are made in the gym but revealed in the kitchen. Add the top 10 flat belly foods to your diet while cutting down on sugar alcohols (sorbitol, maltitol, and mannitol are the worst for causing gas and bloating), fizzy drinks and chewing gum (all of these can increase bloating at least temporarily) and you may fall in love with skinny jeans. Clifton PM, Bastiaans K, Keogh JB. High protein diets decrease total and abdominal fat and improve CVD risk profile in overweight and obese men and women with elevated triacylglycerol. Nutr Metab Cardiovasc Dis 2009;19(8):548-54. O’Neil CE1, Keast DR, Nicklas TA, Fulgoni VL 3rd. Nut consumption is associated with decreased health risk factors for cardiovascular disease and metabolic syndrome in U.S. adults: NHANES 1999-2004. J Am Coll Nutr 2011;30(6):502-10. Kahn HS, Tatham LM, Rodriguez C, et al. Stable behaviors associated with adults’ 10-year change in the body mass index and likelihood of gain at waist. Am J Public Health 1997;87:747-54. Ridaura VK, Faith JJ, Rey FE, Cheng J, Duncan AE et al. Gut microbiota from twins discordant for obesity modulate metabolism in mice. Science 2013;341:6150. Turnbaugh PJ, Ley RE, Mahowald MA, Magrini V et al. An obesity-associated gut microbiome with increased capacity for energy harvest. Nature 2006;444:1027-1031. Vidrine K, Ye J, Martin RJ, McCutcheon KL et al. Resistant starch from high amylose maize (HAM-RS2) and dietary butyrate reduce abdominal fat by a different apparent mechanism. Obesity (Silver Spring) 2014;22(2):344-8. Bisanz JE, Reid G. Unraveling how probiotic yogurt works. Sci Transl Med 2011;3:106. Dhurandhar NV, Geurts L, Atkinson RL et al. Harnessing the beneficial properties of adipogenic microbes for improving human health. Obesity Reviews 2013;19:721-735. Delzenne NM, Neyrinck AM, Bäckhed F, Cani PD. Targeting gut microbiota in obesity: effects of prebiotics and probiotics. Nat Rev Endocrinol 2011;7(11):639-46. Furet JP, Kong LC, Tap J et al. Differential adaptation of human gut microbiota to bariatric surgery-induced weight loss: links with metabolic and low-grade inflammation markers. Diabetes 2010;59:3049-3057. Ley RE, Turnbaugh PJ, Klein S, Gordon JI. Microbial ecology: human gut microbes associated with obesity. Nature 2006;444: 1022–1023. Santacruz A, Marcos A, Warnberg J et al. Interplay Between Weight Loss and Gut Microbiota Composition in Overweight Adolescents. Obesity 2009;17:1906–1915. Harland JI, Garton LE. Whole-grain intake as a marker of healthy body weight and adiposity. Public Health Nutr 2008;11(6):554-63. Yadav BS, Sharma A, Yadav RB. Studies on effect of multiple heating/cooling cycles on the resistant starch formation in cereals, legumes and tubers. Int J Food Sci Nutr 2009;60 Suppl 4:258-72. Keenan MJ, Zhou J, McCutcheon KL et al. 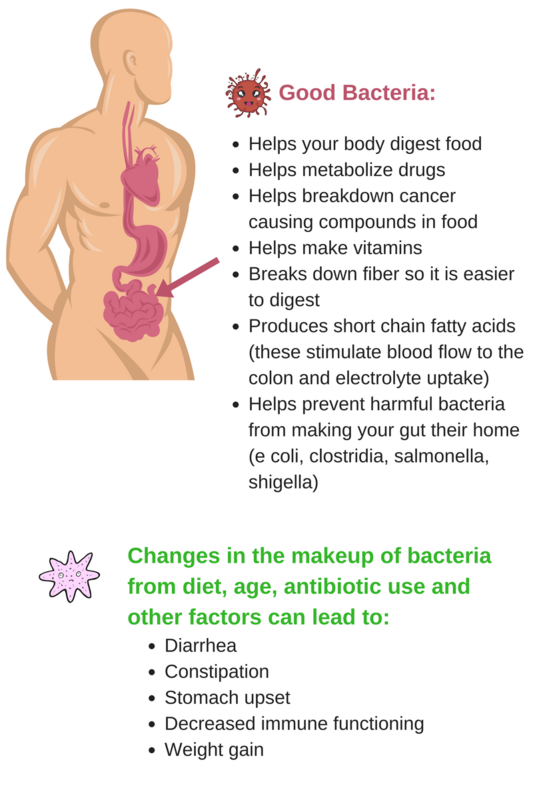 Effects of resistant starch, a non-digestible fermentable fiber, on reducing body fat. Obesity (Silver Spring) 2006;14(9):1523-34. Nagao T, Komine Y, Soga S et al. Ingestion of a tea rich in catechins leads to a reduction in body fat and malondialdehyde-modified LDL in men. Am J Clin Nutr 2005;81(1):122-9. Paniagua JA, Gallego de la Sacristana A, Romero I et al. Monounsaturated fat-rich diet prevents central body fat distribution and decreases postprandial adiponectin expression induced by a carbohydrate-rich diet in insulin-resistant subjects. Diabetes Care 2007;30(7):1717-23. Fulgoni VL 3rd, Dreher M, Davenport AJ. Avocado consumption is associated with better diet quality and nutrient intake, and lower metabolic syndrome risk in US adults: results from the National Health and Nutrition Examination Survey (NHANES) 2001-2008. Nutr J 2013;12:1. Shimizu C, Kihara M, Aoe S et al. Effect of high beta-glucan barley on serum cholesterol concentrations and visceral fat area in Japanese men–a randomized, double-blinded, placebo-controlled trial. Plant Foods Hum Nutr 2008;63(1):21-5. Du H, van der A DL, Boshuizen HC et al. Dietary fiber and subsequent changes in body weight and waist circumference in European men and women. Am J Clin Nutr 2010;91(2):329-36. Peters EM, Anderson R, Nieman DC, et al. Vitamin C supplementation attenuates the increases in circulating cortisol, adrenaline and anti-inflammatory polypeptides following ultramarathon running. Int J Sports Med 2001;22(7):537-43. Sourdough – Safe for Gluten Sensitivity? Gluten’s stretchy fibers give dough it’s rubberband-like elasticity allowing it to stretch when pizza dough is tossed in the air like a frisbee. Gluten-rich dough traps air and water during the baking process so bread rises with delicate ease, producing light and fluffy baked goods. 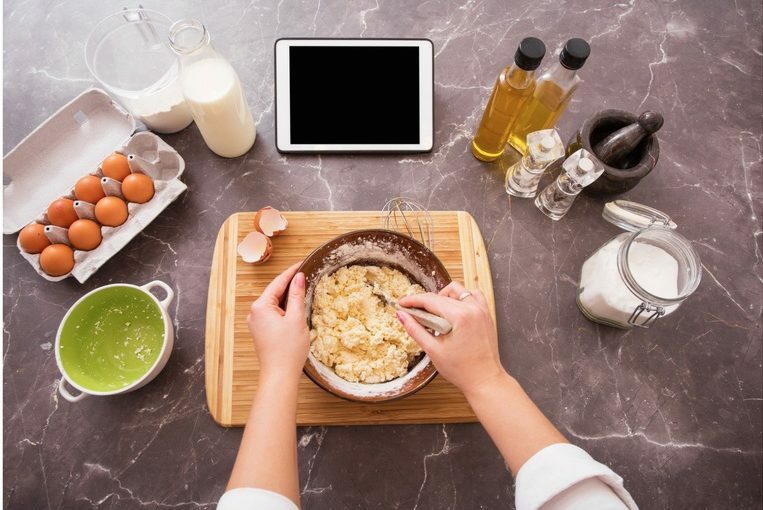 Without wheat (and therefore gluten, which is produced when wheat flour is mixed with water), gluten free items require a blend of flours, starches and additives yet they still can’t replicate the texture of gluten-containing baked goods. Standard yeast leads to a fast fermentation process. This ramps up production speed and it is also foolproof so companies can produce batches of bread at warp speed. Sourdough bread is made slowly, over time, letting the yeast work it’s magic to deliver an array of flavors as well as bread that is easier to digest. In one study, sourdough bread made with selected sourdough lactobacilli and long-time fermentation resulted in bread with gluten levels of 12 parts per million (ppm), which qualifies for gluten-free (anything below to 20 ppm is gluten free). A long fermentation process allows bacteria and yeast adequate time to feed on proteins and starches breaking them down into more digestible parts. Yet sourdough also boasts a lower glycemic index than many other types of bread (including white bread) and therefore it doesn’t lead to a quick spike in blood sugar levels. In another study, conducted over 60 days, baked goods made from hydrolyzed wheat flour, manufactured with sourdough lactobacilli and fungal proteases, was not toxic to patients with celiac disease. Though these studies are groundbreaking, it is far too soon for celiac disease patients to try this at home. 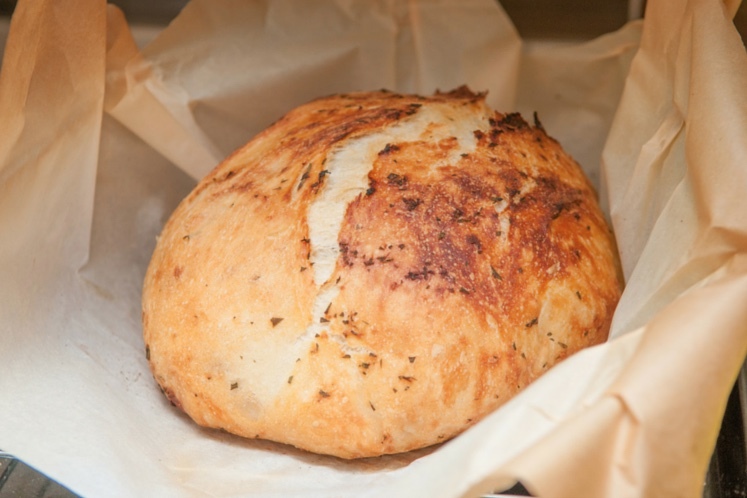 For sourdough bread to be an option for those with celiac disease, a uniform production process would need to be established to ensure the end product is gluten-free. For those with Gluten Sensitivity, Is it Really the Gluten? Some people may experience bloating and flatulence in response to FODMAPs (fermentable oligosaccharides, disaccharides, monosaccharides and polyols). FODMAPs are a type of carbohydrates that are not well absorbed in the small intestine and are present in bread along with a number of other foods (other grains, some vegetables and fruits). In some people the problem may be FODMAPs, not gluten. The long fermentation process reduces FODMAPs. Sourdough starter begins with flour and water that sits for several days while being fed intermittently with both flour and water allowing bacteria (lactobacilli) and yeast to grow and multiply creating live cultures. These microorganisms are what makes the dough ferment similar to the way milk ferments to become yogurt. Check out these recipes to make your own sourdough bread: Healthy Aperture, the Perfect Loaf. If you run into problems making sourdough check out this page for troubleshooting. Posted on May 31, 2016 May 31, 2016 Categories nutrition, UncategorizedTags 12 ppm, 20 ppm, anemia, autoimmune digestive disease, autoimmune disease, bacteria, bread, carbohydrates, celiac disease, disaccharides, elasticity, fermentable, fermentation, flour, FODMAPs, gluten, gluten free, gluten sensitivity, lactobacilli, low glycemic index, monosaccharides, oligosaccharides, polyol, pungent, recipe, safe, science, several days, sour, sourdough, Sourdough bread, starches, water, yeastLeave a comment on Sourdough – Safe for Gluten Sensitivity?